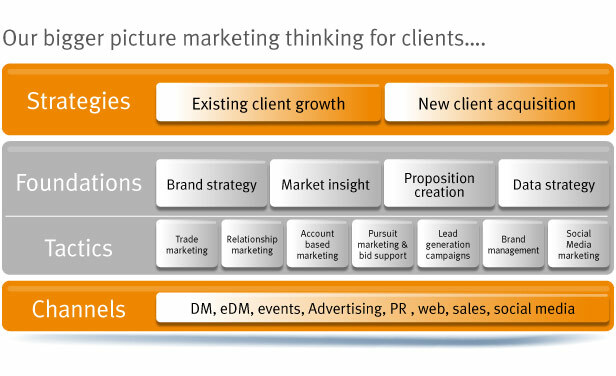 When we develop a marketing program, we like to understand what is driving the objectives behind it. That way we can focus on the ideal outcome rather than an individual activity in isolation. We can design and deliver a range of different program types, to engage different types and levels of audiences to suit your needs. We will design a program to generate new sales opportunities, establish relationships with senior-level contacts or harness the power of trade marketing channels. Strategy - what are we really trying to do? Foundations - Who are we talking to and what do we want to say? Tactics - What's the best type of approach to reach them? Channels - What's the right mix of channels to engage through? This approach ensures that you have the edge over your competition - well thought out, creative campaigns - anticipating your customers' needs. This way of working with our clients has proved so successful, that over 80% of our new business comes from referral.